You'll recognise favourites such as Shosholoza, Mbube (In the Jungle or The Lion Sleeps tonight) and of course Nkosi Sikelel' iAfrika, the South African national anthem, which is not only in the Zulu language but also in Xhosa, Sesotho, Afrikaans, and English. 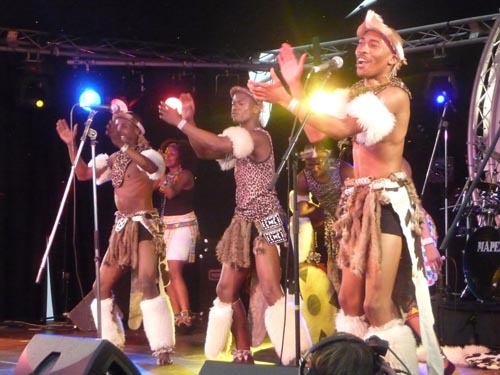 A typical show from ZULU encompasses: Maskandi (indigenous Zulu music); as well as traditional song & dance compilations comprising of Zulu psalms (AMAHUBO); traditional songs (AMACULO ESINTU); and various genres of traditional dance (i.e. iINGOMA, UMZANSI, ISIGENYANE, NENDLAMU). They also present a range of conbtemporary soings written (mostly) in Zulu and occasionally in English by members of the cast. A Stage show may include all of the above as appropriate to the venue and the audience. A typical stage show is in two 45-minute segments featuring both song and lively traditional dance. All of it is in traditional costume. Don't worry if you don't speak Zulu - the guys will always provide a translation. Despite their extensive work at outdoor events during the warmer weather, the performers of ZULU Tradition are no stangers to the big stage. With tours to Europe and Russia under their collective belts, plus concerts and festivals in the UK, they have played for many audiences.